The expedition team with the tallest tree. Standing (from left): Maclean Bosumil, Dr Arthur Chung, John B. Sugau, Juanis Runcin (tree climber), Joel Dawat, Dr Joan T. Pereira, Eyen Khoo, Viviannye Paul, Jemson Jumian, Martin Tuyuk and Postar Miun. Sitting (from left): Marty Marianus, Markus Gumbilil and Hamzah Rusitin. The world’s tallest tropical tree is a towering 94.1 metres ‘seraya kuning siput’ with a canopy measuring 40.3 metres in diameter. TAWAU: In November 2016, at the Heart of Borneo Conference held at The Magallen Sutera Harbour Prof Gregory Asner, an ecologist at the Carnegie Institute of Science at Stanford University announced the discovery via air surveillance of the tallest tree in Danum Valley, Lahad Datu. Asner, who is also the leader of the Carnegie Airborne Observatory (CAO), said the tree is in the genus Shorea, though the exact species has yet to be determined. The tallest is a towering 94.1 metres tree with a canopy measuring 40.3 metres in diameter. Asner and his colleagues also found 49 other trees taller than 90 metres spread all over Sabah (https://news.mongabay.com). Impressed with the announcement and with the hope that it would highlight the need to protect Borneo’s rainforests, Datuk Sam Mannan, the Chief Conservator of Forests instructed an expedition to be organised in 2017 to locate and determine the tree species. Recently, a team of researchers and supporting staff from the Forest Research Centre (FRC) of the Sabah Forestry Department, led by its Forest Botanist (John B. Sugau), together with two guides from Danum Valley Field Centre (DVFC) carried out an expedition from February 20 to 24. Prior to the expedition, the coordinates of the tallest tree, obtained from Asner were plotted on the map of Danum Valley Conservation Area (DVCA). 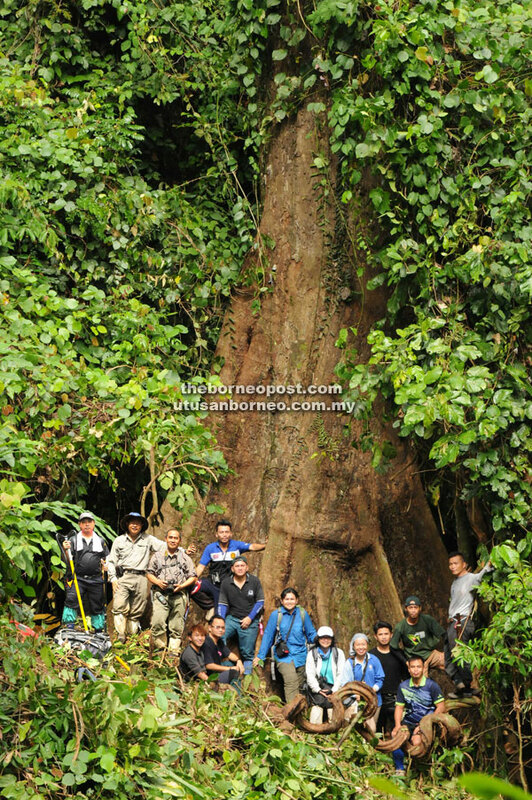 The map showed that the tree is located about 600m south west of Ulu Purut Research Station (UPRS) Camp. UPRS is located about seven kilometres east of DVFC and can be reached by about 4-5 hours trekking through an existing forest trail. The team commenced the search from UPRS Camp at about 8am on February 22 of this year based on the coordinates that were logged into the Garmin Global Positioning System (GPS) receiver. Fifty minutes later, the team found the tree about 150m from the existing Ulu Purut Research Station Camp-Mount Danum Raleigh Camp trail, growing in an old forest gap of Lowland Mixed Dipterocarp Forest on a slope at about 359m above sea level. Juanis Runcin, the tree climber from the Sabah Forestry Department, climbed the tree to obtain leaf samples for species identification and to manually measure the height of the tree for comparison. The tree is botanically identified as Shorea faguetiana F. Heim of the Dipterocarpaceae family or locally called ‘Seraya kuning siput’. The earlier record of the tallest tropical tree in Tawau Hills Park is also of the same species. The tree height was directly measured by the tree climber using line and extendable pole. Two height measurements were taken, one is from the top to the ground at the upper slope (90.8 m) and another to the ground at the lower slope (95.2 m) of the tree. The CAO measurement of 94.1 m is within the range of the measurements. The bole girth is 214 cm diameter measured above the buttress. Apart from the mission to locate and determine the tree species, other observations on the flora and fauna as well as on the presence of any key features were also made around the tallest tree. Among the interesting findings were the discovery of many endemic Begonia species and two scenic waterfalls. Other studies such as soil and forest structure are also being carried out to obtain more information about the surrounding area. Being the world’s tallest tropical tree, it surely becomes a heritage tree and will attract many local and overseas visitors. Though it is already in a protection forest reserve, it may need extra protection such as a track from DVFC and checking station must be manned properly. Among other recommendations that will be forwarded to the management of DVCA are to indicate the tallest tree on the map of DVCA; to establish a user-friendly trail from the existing Ulu Purut Research Station-Raleigh Camp Trail to the tallest tree; to erect signage and information board on the tallest tree at the appropriate location and more importantly to protect the trees from lightning damage, that is, to install lightning protection equipment. The expedition team thanked Sam for his support to the expedition, Asner of the Carnegie Institution for Science at Stanford University for the research collaboration which led to the discovery of the tallest tree and Dr Yap Sau Wai and Jikos Gidiman of Yayasan Sabah for their support and for providing their guides and porter arrangement during the expedition.